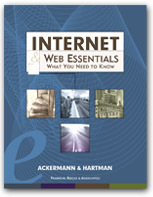 Introductory and survey material about the importance and uses of the Internet and the World Wide Web. Explanation of technical terms and issues. How to get connected to the Internet. Electronic mail allows users on the Internet to communicate with each other electronically. There are several email clients available and other ways to work with email on the Internet. Email discussion groups are examples of asynchronous group communication on the Internet. Group members communicate via email, with messages broadcast to all group members. The news is a collection of messages called articles. Each article belongs to one or more newsgroups, and the newsgroups are arranged in hierarchical order. The Web browser is your access point to the information and resources that make up the World Wide Web. Several types of search tools are available— directories and virtual libraries, search engines and meta-search tools, specialized databases, and intelligent agents. Become familiar with the major search features, such as Boolean logic, phrase searching, truncation, and others, before you get online. Specialized databases are searchable collections on particular subjects. These specialized databases make up a poriton of the invisible Web or hidden Internet. When we want to use the information or resources we find on the Web, we need to exercise some care to make sure they are authentic, reliable, and authoritative. Web pages may contain text, images, video, audio, and other types of information. To work with these requires a familiarity with technical and intellectual property issues. FTP stands for File Transfer Protocol. With FTP, you can share or copy files from one Internet site to another. The Internet and the Web have been designed so that you can be an information provider as well as a consumer. It's important that you understand the technical and design issues involved in creating, providing, and evaluating Web sites. Learning how to use HTML to design and produce appropriate and effective pages. Adding images, video, audio, and interactive elements to enhance the experience for visitors to your Web site. Links on topics that are part of what's commonly known as computer science. The links are meant to be useful to people studying and working in that discipline. There are 446 links for you to choose from!